The "weight of evidence" approach assists manufacturers, importers and employers to evaluate scientific studies on the potential health hazards of a chemical. It aids in determining what information must be disclosed on the label and safety data sheet for compliance with the Hazard Communication Standard. This draft is a companion document to a recently posted Hazard Classification Guidance and is intended to help the label and safety data sheet preparer apply the approach when dealing with complex scientific studies. In his Feb. 11 testimony to the Senate Subcommittee on Regulatory Affairs and Federal Management, Deputy Assistant Secretary Jordan Barab described OSHA's detailed inspection and citation process. Barab stressed that OSHA enforcement is an important tool to deter employers from overlooking their responsibility to provide a safe workplace. He noted that OSHA generally reduces penalties for small employers, as well as for employers who are shown to be acting in good faith or have a history of no OSHA citations over the previous five years. "We continue to work hard each and every day to ensure employers are protecting their workers from the myriad of safety and health hazards in workplaces across this country," Barab told the committee. "And, we put great effort into making sure employers have all the necessary tools required to meet their responsibilities." 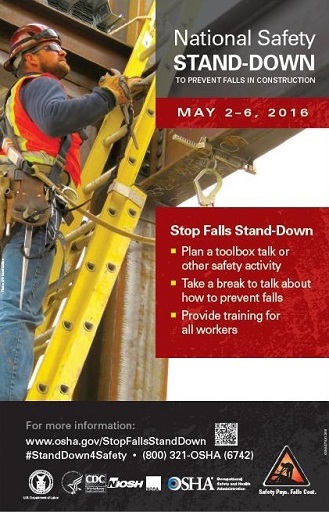 OSHA, the National Institute for Occupational Safety and Health and the Center for Construction Research and Training have announced May 2-6, 2016, as the official week for the third annual National Safety Stand-Down. The event is a nationwide effort to remind and educate employers and workers in the construction industry of the serious dangers of falls that remain the leading cause of death in the industry. Employers are encouraged to pause during their workday for topic discussions, demonstrations, and training on how to recognize hazards and prevent falls. More than four million workers participated in the National Safety Stand-Down in 2014 and 2015. OSHA expects thousands of employers across the nation to join the 2016 event. To guide their efforts, OSHA hosts the official National Safety Stand-Down website with information on conducting a successful stand-down, including the 2016 Stand-Down video. 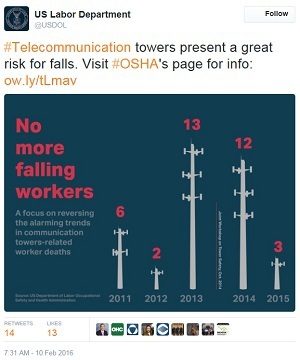 The National Safety Stand-Down in 2016 is part of OSHA's ongoing Fall Prevention Campaign, which provides employers with lifesaving information and educational materials on how to take steps to prevent falls, provide the right equipment for their workers and train all employees on its proper use. For more information, see the news release. An OSHA inspection of two residential roofing worksites found employees working at heights of 14 feet or more without fall protection. Ziggy's Roofing Inc. was cited for five violations for failing to provide fall protection such as guardrails, safety nets or personal fall prevention devices, as well as head and eye protection. The Norridge, Ill., roofing contractor was issued proposed penalties of $115,500. OSHA inspected the company four times since 2003 for exposing workers to fall hazards at Chicago area construction sites. Read the news release for more information. A Dollar General store in O'Fallon, Mo., faces a $163,000 proposed penalty after an OSHA inspection found a 5-foot high, 15-foot long pile of trash blocking an emergency exit, as well as workers exposed to fall hazards, blocked electrical panels, an exit sign posted at a door that was not an exit, and unlabeled circuit breakers. "Blocked exits can be the difference between life and death in an emergency," said Bill McDonald, OSHA's area director in St. Louis. "Dollar General needs to immediately address hazards found in O'Fallon and at its stores nationwide." For more information, read the news release. A 39-year-old worker conducting maintenance on a crane broke multiple bones after falling more than 40 feet at TimkenSteel's plant in Canton, Ohio. The company was cited for five violations for exposing workers to falls by not installing guardrails or providing protective equipment, failing to use locking devices and guards on cranes during service and maintenance, and improperly powering down equipment. Proposed penalties total $129,500. This incident marked the company's second life-threatening injury in 2015. Another worker was severely injured when a crane's safety latch failed and 1,000 pounds of equipment fell on him. TimkenSteel has been placed in OSHA's Severe Violator Enforcement Program. For more information, see the news release. California OSHA issued citations and $74,500 in fines to Vitco Meats and a staffing agency, Volt Workforce Solutions. Inspectors determined that neither company had trained workers to operate or clean an industrial meat grinder, resulting in a worker receiving serious hand and arm injuries and nerve damage. Inspectors found that Vitco Meats did not ensure proper procedures were followed to prevent the unintentional startup of the grinder and failed to provide a required cover with interlock. Inspectors also cited Volt Workforce Solutions for failing to ensure that Vitco Meats had in place safety measures to protect temporary workers. For more information, read the Cal/OSHA news release. The Washington Division of Occupational Safety and Health issued $427,000 in fines to The Roof Doctor Inc. in Olympia, for failing to protect workers from fall hazards. Inspectors issued six willful citations after determining the company exposed six workers to falls from as high as 23 feet at a residential roofing project in Castle Rock. For more information, read the Washington DOSH news release. OSHA will host the third meeting of the Emergency Response and Preparedness Subcommittee of the National Advisory Committee on Occupational Safety and Health on Feb. 24-25, 2016, in Washington, D.C. Among other issues, the subcommittee will continue discussing potential elements of a proposed emergency response and preparedness rule. The meeting is open to the public. For more information, read the news release. OSHA has scheduled a meeting of the Federal Advisory Council on Occupational Safety and Health on Feb. 18 in Washington, D.C. The tentative agenda includes updates on the Presidential Initiatives that focus on workplace safety and health in federal agencies, returning federal employees to work after on-the-job injuries/illnesses, and the proposed OSHA safety and health program management guidelines. The meeting is open to the public and the announcement appears in the Federal Register. For more information about the meeting agenda, submitting comments or requesting to speak at the meeting, see the news release. FACOSH advises the Secretary of Labor on all matters relating to the occupational safety and health of federal employees. The 16-member council is composed of eight members representing federal agency management and eight representing federal employees. OSHA is accepting nominations for three labor and three management representatives to serve three-year terms, effective Jan. 1, 2017. Nominations may be submitted at www.regulations.gov, by mail or facsimile. The deadline for nominations is April 29, 2016. For details, see the Federal Register notice and the news release. OSHA has rescheduled its public hearing on the proposed rule to amend existing limits for exposure to beryllium in general industry. Formerly scheduled for Feb. 29, the hearing will now be held in Washington, D.C., on March 21. The hearing will begin at 2 p.m. in the César Chávez Auditorium, U.S. Department of Labor, 200 Constitution Ave., N.W., Washington, D.C. If necessary, it will continue on subsequent days. OSHA and Health Canada are continuing their collaborative work to align workplace hazard communication regulations in Canada and the United States. The Regulatory Cooperation Council held initial discussions in the United States in November 2015 and in Canada in December 2015. To further these discussions, Health Canada and OSHA representatives will be hosting a webinar on March 3, 2016. 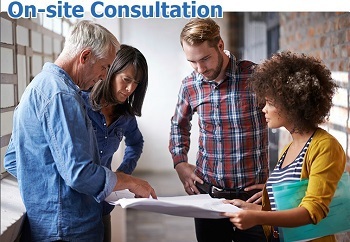 The webinar will present the updated work plan and request input from interested stakeholders. To find out more about the work plan and how to attend the webinar, please visit the Regulatory Cooperation Council section on the Hazard Communication website. OSHA has announced the 2016 Step-Up for Safety in the Upstream Oil and Gas Industry to raise awareness among employers and workers about hazards in oil and gas exploration. During Step-Up events, employers around the country will take time out to conduct site inspections, safety training and other activities. These events will be held mid-February until the end of March. The Step-Up is part of OSHA's alliance with the National Service, Transmission, Exploration & Production Safety Network and the National Institute for Occupational Safety and Health. Twenty-two regional STEPS Networks will coordinate and promote the events. For more information, read the news release and visit the Step Up for Safety website and watch the video. OSHA reached out to more than 100 employers and workers at the Agricultural Safety Connection conference last month in Stevens Point, Wis. This was the second year the conference brought together the area’s dairy and crop producers, government agencies, educational institutions, insurance companies, agribusiness services, and non-profit organizations. Conference topics included safety and health practices during emergency response, keeping workers safe while working in grain bins, responsibilities of contractors to protect workers, and ergonomic hazards. OSHA’s Wisconsin offices helped organize the free conference. OSHA farm safety resources are available on its Agricultural Operations Safety and Health Topics page. OSHA has renewed its strategic partnership with the Arkansas Chapter of the Associated General Contractors of America Inc. to help prevent exposure to workplace hazards in the construction industry, and encourage a better understanding of workers' rights and employer responsibilities. The agreement will remain in effect for three years. For more information, read the news release. OSHA and the Crane, Hoist and Monorail Partners have renewed their alliance to prevent worker exposures to electrical shock, falls, and being struck by moving equipment. The alliance partners plan to develop best practice fact sheets and training resources that address electrical hazards, falls and struck-by incidents, and new technology. The alliance will promote cooperative program initiatives including the National Safety Stand-Down and protecting temporary workers, and encourage a culture of safety within the industry including among small businesses and non- and limited-English speaking workers. For more information, see the news release. River Metals Recycling, of Crescent Spring, Ky., was reapproved for participation in OSHA's Safety and Health Achievement Recognition Program. SHARP recognizes small business employers who have used OSHA's On-site Consultation Program services and operate an exemplary injury and illness prevention program. River Metals Recycling has been recognized by the State of Kentucky for an exemplary workplace safety record: protecting more than 250 workers during ferrous and non-ferrous metals recycling activities. A worker collecting a sample from the open hatch of a production tank. Image: J.D. Danni, OSHA. 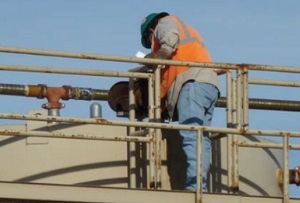 A new hazard alert from the National Institute for Occupational Safety and Health and OSHA identifies health and safety risks to oil and gas industry workers who manually gauge or sample fluids on production and flowback tanks. It was triggered by a series of deaths related to manual gauging of tanks, all of which were preventable. 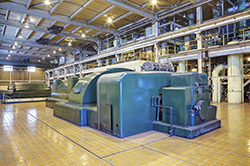 OSHA has released a Safety and Health Information Bulletin explaining the hazards associated with hydrogen gas-cooled electric generators. In 2011, a worker was fatally burned when an electric drop light and fan sparked a flash fire in a gas-cooled generator. The bulletin describes how employers can prevent similar tragedies. For example, to prevent injury or fatality, employers must ensure hydrogen gas is completely purged from generator housings and bushing boxes before conducting maintenance. Climbing for work? NIOSH's award-winning Ladder Safety app, first released in 2013 to provide user-friendly guides and interactive tools for extension ladder selection and safe use, now includes step ladder safety resources and other enhancements based on user input. Download the free app, available in English and for iPhone/iPad or Android. Visit the NIOSH Ladder Safety Mobile Application webpage to learn more.